Our unique training programs are geared toward the development of pump operator/engineer practical skills that translate directly to the fireground experience and improved proficiency. The customer is in control. We work directly with department personnel, no mystery and no doubts about the process. On Site Services that come to you at your convenience. FDSS. LLC was formed in 2008 by retired fire chief Alex McCurdy. Alex served in the fire service for 35 years as Firefighter, Training Officer, Instructor, Lieutenant and Chief of Department in two municipalities. These are just some of the services that we provide. Call us for more info. FDSS provides on-site pump service testing utilizing the industry leading FD International self-contained mobile platform. 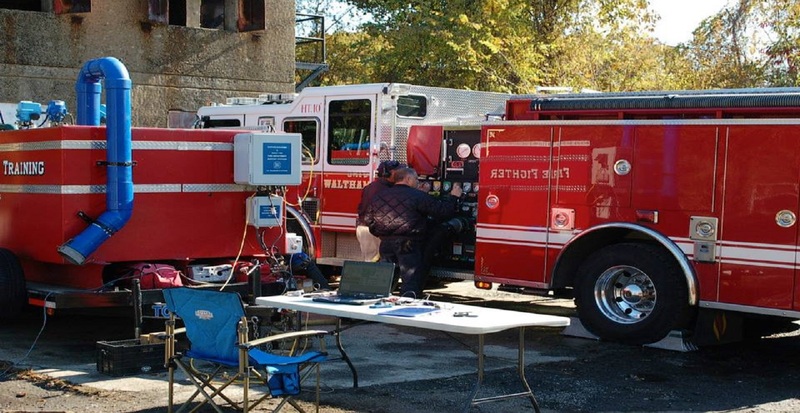 Our equipment addresses NFPA standards for apparatus pump testing though an advanced computerized operational system that facilitates efficiency and accuracy. We use the Underwriters (UL) test records provided when the apparatus was new, as the basis for testing. A well maintained apparatus will be able to perform, as it did when it was new, for its entire service life. 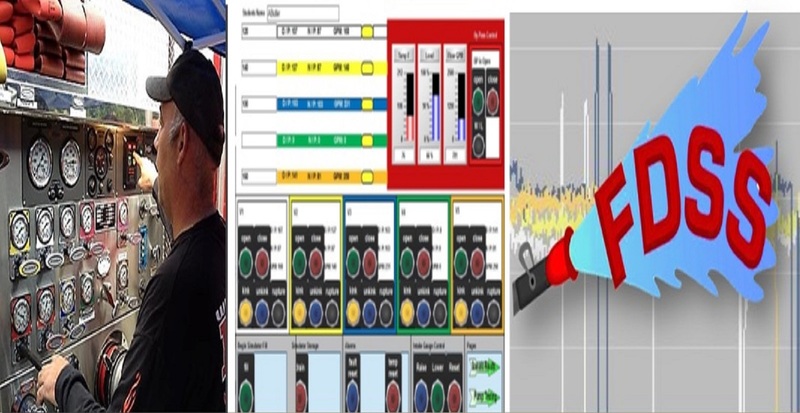 FDSS pump test reports provide valuable data the customer can evaluate. This data may aide in identifying maintenance and even operator training needs. Our pump testing falls well within the parameters of normal expected operational requirements and service test standards. However, just like on a fireground, equipment can fail during the testing. Most, if not all, fire officials would prefer a failure to occur someplace other than in the midst of a firefight. That is why annual testing is doubly important. Pump testing should also be done anytime repairs are conducted that can affect the performance of a pump. Testing may likewise be a consideration anytime there is reason to believe something occurred that may have affected the ability of the pump to perform to its rated capacity. Safety of personnel during testing is also important. The FD international technology is probably the safest testing platform available on the market. NFPA Standard 1911, Chapter 18 contains information that serves as the basis for the need to conduct annual pump service testing. This standard is detailed. Boiled down to its simplest logic, the pump test helps determine the readiness of the apparatus pump to perform to its rated criteria. In this way, the testing is far more valuable than simply attaining compliance. Testing should be considered one of many tools the fire department uses in evaluating the ability of the heart of firefighting pumping apparatus, to deliver as expected. Testing on an annual basis is part of the 1911 standard. However, a lot can happen to a pump that could diminish its performance between tests. A pump service test should be conducted anytime there is doubt about the ability of the apparatus pump to deliver to its rated capacities. Testing includes the tightness of the pump as determined by a vacuum test. This requires the primer pump to draw vacuum to 22inches of mercury with a loss of no more than than 10 inhg vacuum in five minutes , Flow tests are done at 150, 165, 200 & 250 PSI NET pump pressure. Pressure relief system operation is checked at 90, 150,200 and 250 PSI. There are a number of other checks completed as well. Testing is only one of many tools needed to keep apparatus ready to perform. Testing, regular maintenance and training all contribute to pump performance reliability. When a particular pump falls short in its performances, we are often asked, if it should be taken out of service. That responsibility is solely in the hands of what NFPA calls the Authority Having Jurisdiction or AHJ. There are a lot of factors to consider. FDSS is an information resource that helps the AHJ to evaluate, prioritize and make that decision. The fire apparatus Pump Operator of today is not as practically skilled as generations in the past. They are well schooled in pump theory and hydraulics. What they lack is practical experience in properly supporting multiple lines. The reduction in the number of multi-line fires incidents and the advancement of operational technologies used to operate a pump, while valuable, have contributed to a disconnect. The basics of a centrifugal pump have remained essentially the same for generations. Electronics and other technologies have changed how we operate them. Some people believe the advancing technology has contributed to complacency and a false sense of operator confidence. At the same time the danger posed by fire has increased. What were ordinary combustibles in the 60’s & 70’s is now a complexity of chemistry evolving as a fire progresses. True danger, like never before, lurks for fire attack crews. Now is actually the time for pump operators to be highly skilled in the deployment of multiple lines & pressures, the management of water supply and the constant state of awareness related to the status of a pumping operation. This is the heart of what FDSS training addresses. Our combination of experience and technology targets the core of where operators need to improve. Our core programs relate directly to understanding and experience in the most real-world aptitudes of pump operations. We challenge the notion that technology replaces the need for savvy and presence of mind. The pump operator, in our FDSS hands-on program, gets to replicate the first 30 minutes of a fire. The kind of fire we don’t see that often these days. A fire of multiple hose lines of different diameter, tactical objective and pressure requirements. Events that challenge a pump operator are front and center in our programs. The difference is there isn’t a fire or someone, potentially in harm’s way. The pump operator in the FDSS program will successfully deal with events such as a hose rupture, the loss of water supply as well as many other challenges pump operators will face. We have shown time and time again that this training translates to a better outcome in a real event. The benefits of a competent operator are truly tangible. They include a higher degree of safety for hose crews, improved operational efficiency and less inadvertent damage to pumps. This training helps re-integrate the pump operator into the overall ICS “big picture”. Our programs are effective for the smallest volunteer departments to the largest metro departments alike. After all, protection of lives and property are universal, no matter who, where or what. Our FD International technology is completely mobile and comes to the customer. Apparatus is taken out of service for a minimal time. Mobile technology saves time, money and resources. It also makes the testing process more transparent to the customer. Many times department personnel can initiate minor fixes right on the spot. Not all mobile technology is equal though. Likewise, not all mobile testing is considered a step up in technology. Many mobile platforms are reshuffled old technology. The FDSS equipment is different. Our testing is computerized with 100% monitoring of the water flow. It is made from steel and has carefully engineered baffles designed to control turbulence. We use self-checking flow meters. Pressure and temperature sensors are tied into the HMI system. There are no nozzle tips to change or conversion formulas needed. Our reports are five pages long featuring both a quick reference summary report and detailed test data. Water heating up is an issue with all self-contained systems. The steel design in the FD International equipment helps dissipate the inevitable buildup of heat. This means we ultimately use less water. The HMI System also triggers an automatic shut down if the water gets too hot. With only four or five lengths of hose in use, safety becomes enhanced. The testing unit is shorter and more compact than other self-contained systems so we take up less of your real estate to do testing. FDSS has been utilizing this equipment since 2008. This means we have tested hundreds of pumps. But that is just the beginning. FD International units are all over the world. It is tried and proven, efficient and cost effective technology.